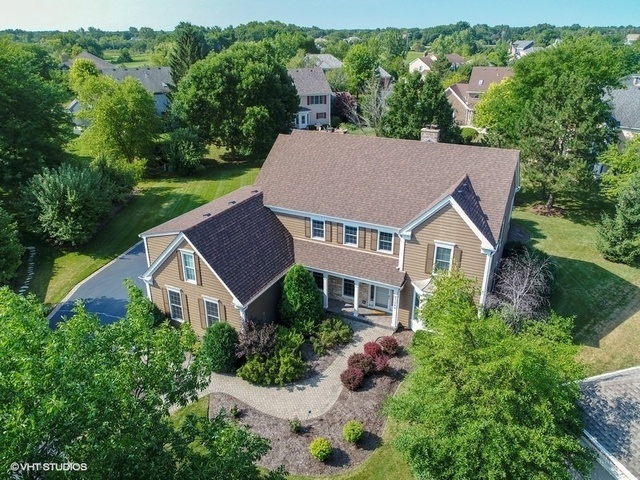 Virtual Tour G-O-R-G-E-O-U-S w/Stevenson HS, interior lot on a cul-de-sac w/5 bdrms & 3 1/2 baths w/rich hardwood floors, white trim & neutral decor t/o. UPDATED & REMODELED! Gourmet kitchen w/ 42" white cabinets & crown molding, espresso colored island, granite countertops & ss KitchenAid appliances. AMAZING 2-story, 18' height, family room/great room w/stone fireplace. Private 1st floor office w/ French doors. 2nd flr laundry room! Large master bedroom suite w/vaulted ceiling + master bath w/travertine tile shower, spa tub, comfort height dual sink espresso vanity & WIC w/ custom organizers. 2nd flr w/J-n-J + hall bath w/travertine flrs & comfort height vanities w/granite countertops. Impressive finished basement has plenty of space for kids to hang out w/rec area, tv-gaming area + huge storage rm. Relax on your beautiful brick paver patio w/water feature & sitting wall. 3.5 car gar. 2016-2 AC units & furnace. 2015 roof & gutters! Close to Marianos, Deer Park shopping, restaurants + so much more. I was searching on Blue Fence and found this listing. Please send me more information about 21345 West Williamsburg Court , Kildeer, Illinois 60047. Thank you.